A bill signed into law by New York Gov. Andrew Cuomo in September may be the start of other changes on the horizon regarding charges for access to medical records. The new law prohibits health care providers in the state from charging fees to low-income disabled residents who need their medical records to apply for government benefits. Previously, the law stated that providers could charge a "reasonable fee" that was not to exceed $0.75 per page. Though the law has been called a huge win by legal groups, there are at least some concerns that should not be overlooked in the health information services field. While acknowledging the law is a great benefit to patients who need their medical records for advancing their other rights involving government benefits and programs, Kyle Probst, legislative chair of the Association of Health Information Outsourcing Services (AHIOS), says it illustrates that the majority of medical record requests are made to further commercial interests. "These requestors can afford to compensate the providers for the labor necessary to produce the record," he says. "This type of legislation tends to devalue the service of producing a patient medical record while protecting patient privacy. The con to this type of legislation is that entities that can afford to pay for the service of producing a medical record think they should get the same benefit as the patient." Probst emphasizes that AHIOS members fully support a patient's right to obtain medical records for necessary patient activities such as supporting health insurance claims, continuing care, providing evidence in lawsuits, and accessing government benefits or programs. However, he adds, when the law mandates no fee may be charged for certain record requests, it must be noted that operational expenses for hospitals will increase as a result. Peggy Presbyla, RHIA, CHP, HIM assistant director for release of information at Upstate University Hospital's campus in Syracuse, New York, believes the law's passage is a positive step but agrees that costs should be taken into account. "We are here for our patients, and if that means helping them to get their records to help file for benefits they are entitled to receive, that is important," says Presbyla, who also serves as the New York Health Information Management Association's legislative director. "I have been in this business for more than 30 years, and patients have always been the main focus for us HIM professionals—mostly protecting their confidentiality, but helping them in these types of situations is also very important. While it is not our intention to make a profit in release of information, like any business, there are costs involved, including staff time, paper, toner, CDs, and postage." Presbyla says Upstate University Hospital will no longer be billing copies of medical records requested for the purpose of government benefit claims. Depending on the interpretation of the law, this may include lawyers representing the patients who are seeking New York State disability benefits. "There are many law offices in New York State that only do New York State disability claims," she says. "The New York State Office of Victim Services has sent out notification stating that due to the new law they will no longer reimburse for records sent to them. We have yet to hear anything from the New York State Office of Disability." Is More Change on the Way? The passage of this law appears to be part of an ongoing trend and likely will not be the end of such changes. Probst says AHIOS research indicates that 16 states currently have some variation of the New York law mandating free record production when the records are needed for government benefit programs. And it's believed that other states may also follow suit. "Several states have a structured fee schedule for requests related to government benefits or programs and those fee schedules are typically less than the fee schedules established for third-party commercial requestors," Probst says. "Every year we see several bills introduced at the state level that impact fees that may be charged when records are needed to support an application or claim for government benefits. 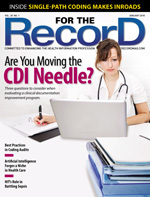 We expect this trend to continue due to the increase in electronic health records." As more patients access government benefits programs, Probst expects to see an increase in the misunderstandings associated with the labor involved in producing patient records. Presbyla urges New York's HIM professionals to educate themselves on the current changes to better understand the law's effects on day-to-day operations. "It is important to read the law and then determine how it will affect the way you process records at your facility," she says. "The law specifically states, 'No charge may be imposed under this section for providing, releasing, or delivering clinical records or copies of clinical records where requested for the purpose of supporting an application, claim, or appeal for any government benefit or program, provided that, where a provider maintains clinical records in electronic form, it shall provide the copy in either electronic or paper form, as required by the government benefit or program or at the patient's request.' They need to base any changes to their policies and procedures on their interpretation of the law and seek input from their legal counsel if they feel they need it."